CGC Is it Really worth it ??? Hi, In July 2001 my father gave me 10 boxes of Books. These boxes he had carried around since the 1950's. Low and behold 2 of the boxes were full of comics. When I found these I was overwhelmed by the "All over the board pricing" I found on the Internet. Then I discovered CGC. Then I found out that they had recently moved to Sarasota, Florida. About 2 blocks from my office. After I visited them and showed them my collection of over 300 comics, they picked out 29 that they felt should be graded to preserve them and authenticate them. 1 of them happened to be Flash #4. 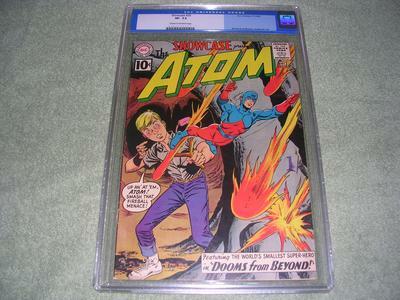 To this day still happens to be the 6th best known copy in existance, CGC Graded of course. As far as value ??? Value is what another individual is willing to pay. The value at the time was $16,000.00 which, according to the triple value theory, blew me away. But unfortunately only one reputable collector was willing to make an offer. I ended up selling it for $9000.00. So if you ask me after spending $1,700.00 to have 29 comics graded and only making 75% of the Overstreet value on the 6th best known copy of #4 Flash, I am extremely diappointed. People want to know they are getting what they are paying for. But they don't want to pay for the service or the certification. They don't want to pay shipping. And to boot they want to pay only 50% of guide price. So Is it worth it or not ?? ?